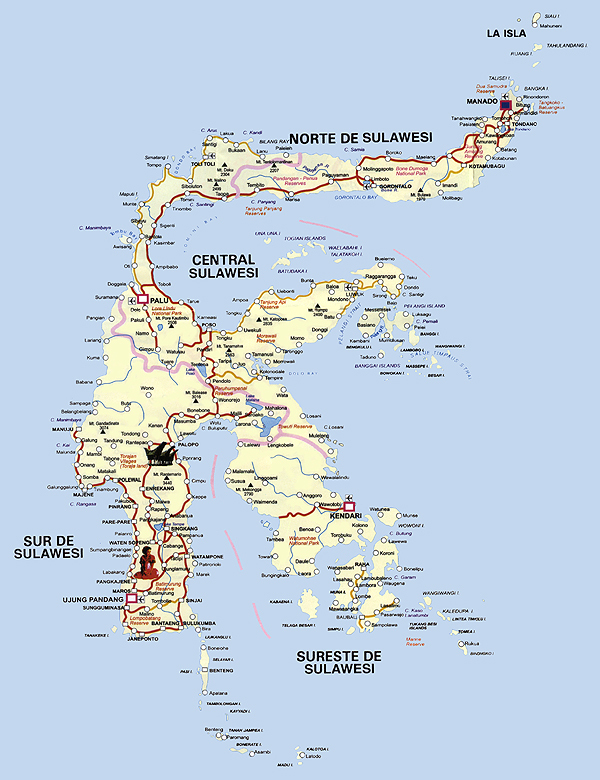 Once called Celebes, Sulawesi was born of a violent collision between two islands three million years ago. As a result, much of it was thrust above 500 meters where, today, 17 active volcanoes still growl. The island's extraordinary shape gives the forested 227,000 square kilometer land mass a massive 6,000-kilometer coastline. On top of that, it also boasts coastlines of more than 110 reefringed offshore islands. So remote is Sulawesi that its wonders have been largely ignored by the 20th century. 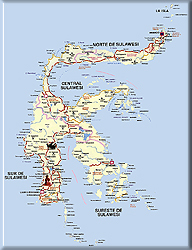 Sulawesi offers excellent trekking, white water rafting, sailboarding, eco tourism, cruises & sailing and scuba diving. Flights: Direct from Singapore to Manado and Ujung Pandang; small aircraft from Ujung Padang to Toraja; domestic flights from major cities to Manado and Ujung Pandang. Land: Cars and minibuses are available; regular intercity mini buses in North Sulawesi. Hotels and resorts offer airport transfers. Accommodations: International standard hotels up to four-star in Ujung Padang and Manado and three-star in Tana Toraja. Dive Season: Good from March to November. The best is expected in April and October. Internet Access: In Manado you can access the internet at The News Cafe in the heart of town. The cost is less than $1 per hour and the speed is usually pretty good for email. While surfing you can enjoy a cup of traditional Turanese coffee or a soft drink or snack. Atmosphere is comfortable and relaxed and the staff is always more than happy to assist you with technical help if necessary. They also have a networked printer that will allow you to print those important messages. Scuba Diving in Sulawesi - Remote, Pristine, World-class. In 1989, 75,265 hectares of underwater at the northern tip of the island were made a national marine reserve - the Taman Nasional Laut Bunaken-Manado Tua. The reserve, which is reached by a short boat ride from Manado City, has world-class diving. Steep and pristine walls are smothered with hard and soft coral, and are a dazzling show of fish life. Access to this astonishing marine wonderland has vastly improved with recently introduced non-stop international air connections. Further north lie the Sangihe-Talaud Islands, dominated by the 1,827 meter Karangetang volcano with its sulphurous clouds. Diving in Sangihe-Talaud is so new, it brims with the unexpected and unknown. The best way to explore these waters is on board one of the live-aboard dive vessels operating trips to either Sangihe-Talaud or the Togian Islands. The Togian Islands, located off the Eastern coast of Northern Sulawesi, represent every known type of coral within an unusually small area. Taka Bone Rate in South Sulawesi is the third largest atoll in the world. As for the Tukang Besi islands, it is rumored that Jacques Cousteau once said that it held the finest diving in the world. On the south side of Sulawesi is located Wakatobi Resort. Said to have one of the best house reefs in the world, they cater to divers who are looking for those remote, untouched reefs. Divers can enjoy some of the finest diving in the world from any of three dive resorts or live-aboards. All are driving distance from the Manado airport and each offers its own collection of ammenities to guest divers. Hotel Santika is the home to Thalassa Dive Center, a PADI Five-Star Dive Center located about 30 minutes east of Manado. For divers who want to enjoy the comforts of a four-star hotel, this is the perfect option. Murex Dive Resort is about 30 minutes west of Manado. Murex offers a complete dive/accommodation package as well as three different live-aboard options. The Tangkoko-Dua Saudara Reserve, located In Batu Putih, North Sulawesi, Indonesia. Kukunan Bay Resort is located near Bitang in the middle of the Lembeh Straight, about 1.5 hours from Manado.